Good processing can make a huge difference to the quality of a photograph. Many people view image editing as a cheating but it's an essential step in modern digital photography. If you don't process your images you won't realise the true beauty locked away -n your digital files. This image of the Janet's Foss waterfall demonstrates this well. Below you can see the starting image prior to any processing being carried out. The image at this point is full of harsh shadows and contrast and whilst the location is beautiful, this picture certainly doesn't convey this. If I didn't have a vision for this image when I shot the photography, I would probably overlook the image or even delete it. As a photographic artist you need to realise your vision in the image and share it with your audience. The image was captured using an Olympus OMD EM5 digital camera. This is a Micro 43 camera with a 16Mpixels sensor. The lens was an Olympus 12-40mm lens set to 15mm. The camera ISO was set to ISO200 which is the base ISO for this camera and should therefore provide the greatest dynamic range and image quality. The lens aperture was set to f/7.1 and the point of focus placed on the rock in the foreground. This gave an excellent combination of quality and depth of field. 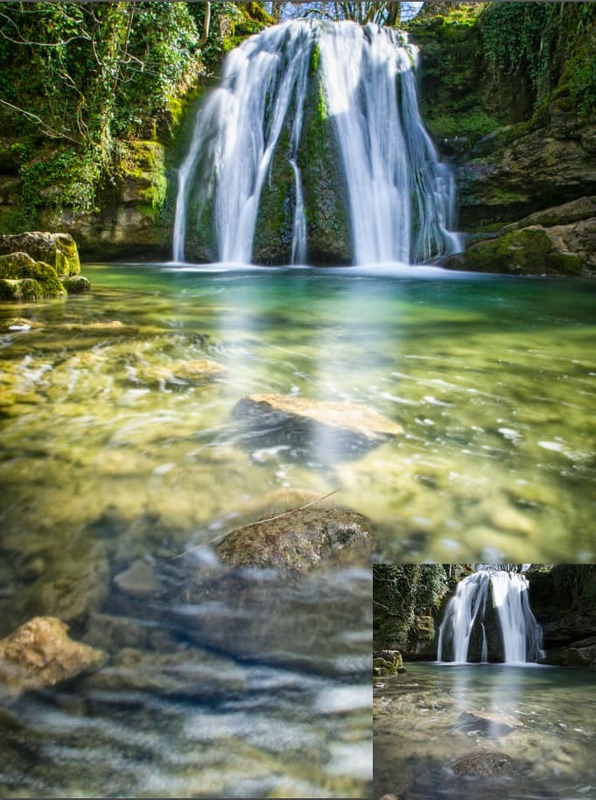 A slow shutter speed of 12" was used to allow the movement in the water to become evident. It was necessary to use a 6 stop filter (a Lee Seven 5 little stopper). With the shutter speed so slow it was necessary to mount the camera on a tripod and use a remote release to trigger the shot. The image above was captured in RAW format to produce the highest quality image and also provide more flexibility in processing. The conversion from RAW was carried out in Lightroom before the resulting image was transferred into Photoshop for further adjustment. With the image (RAW file) selected in the Lightroom develop module the first change was to switch the camera profile from the default Adobe profile to a custom profile I had previously created for the EM5. If you are a Lenscraft Member you can download this profile from the Camera Profiles page of the lenscraft site. You can change to another profile (if you have one installed) using the "Camera Calibration" tab as shown below. You will find any other compatible profiles installed to your computer, in the "Profile" drop down. Remember, only those profiles created specifically for your camera will be available. Also that you can only change profiles when you are editing a RAW file. Changing the profile is not essential but I have found the custom profiles perform better than those shipped with Lightroom. 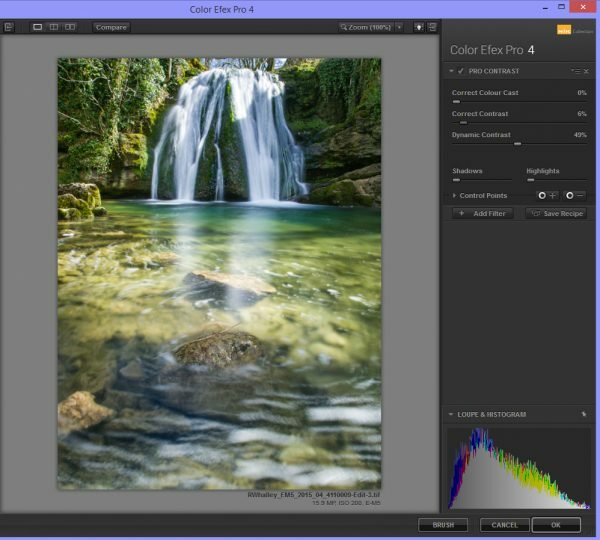 Having changed the colour profile I start to edit the image using the controls in the "Basic" panel which is shown below. I started editing by increasing the contrast (+25) as despite the high contrast range of the scene, the image was lacking contrast. I then progressed to adjusting the Highlights, Shadows and Whites sliders. 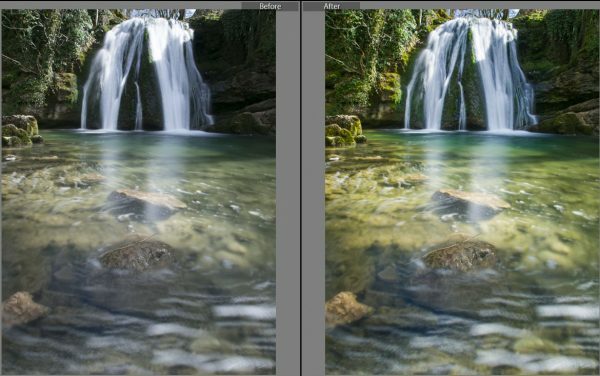 Here the Highlights slider has been reduced to control the highlights in the waterfall from becoming blown out. This then necessitated a slight increase to the Whites slider to give the image some of it's "sparkle" back. The other point to notice in these sliders is the large increase in the Shadows slider in an attempt to open some of the shadows in the rocks around the waterfall. This image is quite green from the surrounding foliage and the shade was also causing a strong blue tint in some areas. 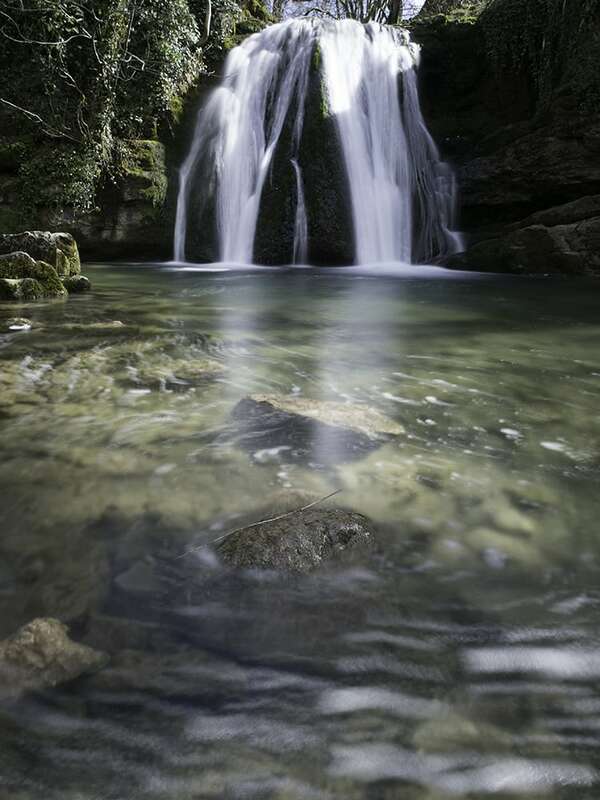 I therefore used the white balance eye dropper tool to select a white balance point from the waterfall. This set the Temp and Tint sliders as seen in the screenshot. The next group of sliders to be adjusted was the Clarity, Vibrance and Saturation levels. There is no secret here other than to say don't go too string with any of the sliders and to simply judge when you are happy. Finally I tweaked the Exposure slider slightly to give a little more brilliance to the image whilst being careful not to blow out the highlights in the water. The other area of adjustment I want to make is to the dark shadow areas around the waterfall. You can see these in the following screenshot. 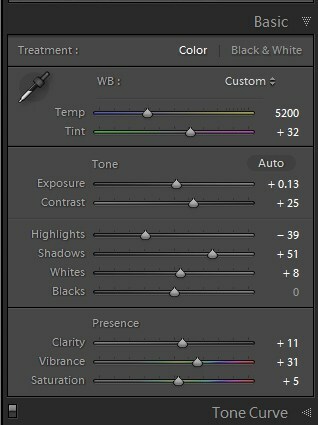 In the following screen shot you can see the brush settings being used. This was used to paint over the dark rocks in order to open up the shadows. The red areas of the image are the mask which shows the areas where the adjustment has been painted. 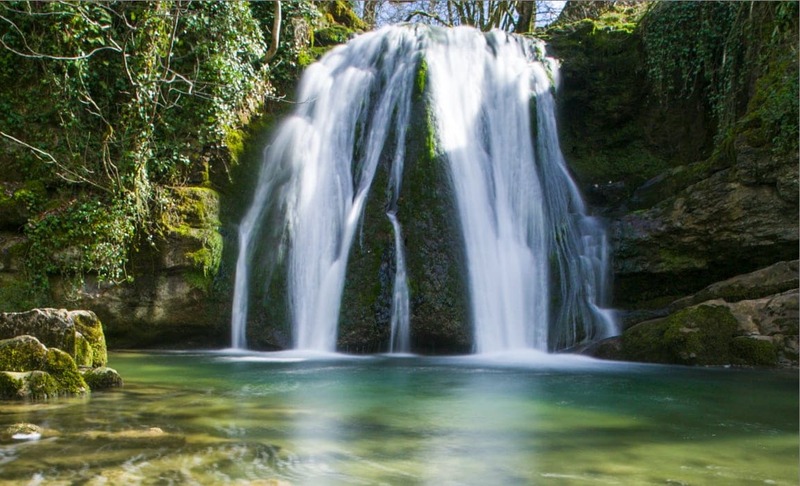 A further adjustment is them made to the water in the waterfall to add definition using the clarity slider. This is done by adding a "New" adjustment brush. You can see the adjustment settings and where they have been applied in the following screen shot. Notice also how the contrast has been removed from the water otherwise it would become too bright and lose detail. The reduction in the Highlights and increase in the Shadow sliders also help to remove the contrast. With the RAW adjustments complete the image is as shown below together with the starting image, and is ready for further processing in Photoshop. The intention in Photoshop is to process the image using the Nik Color Efex plug-in filter. I am a big believer in using plug-ins from the likes of Nik, Topaz and others. You can read more about the filters I use on the Useful Software page of Lenscraft. Nike Color Efex offers a huge range of filter adjustments which can be rather confusing. If you would like to know more about the range of filters and what they do, I will refer you to my book on Amazon which cost about the same as a cup of coffee. For this image the three filters I want to use are "Pro Contrast" and in particular the Dynamic Contrast slider, Detail Extractor in order to open up the shadow detail further and the Lens Vignette filter to darken the edges of the image. In the following screenshot you can see the strong dynamic contrast being added in to the image. This also has the effect of opening up the shadows a little more and is one of the most useful contrast enhancement tools for landscape scenes. The following screen shot shows how the Detail Extractor is used to open up the shadow details. This also necessitates a further contrast adjustment otherwise the image becomes too open. Finally there is the Lens Vignette which is used to darken the corners and edges of the image as shown below. The image adjustments are now complete. The OK button is clicked to return to Photoshop. The finished image appears natural yet is a huge improvement on the starting image. The final image can be seen below with the original image inset bottom right. You can learn more about editing photos in the Lightroom by reading my Overview of the Lightroom Develop Module tutorial. I would also recommend my book Mastering Lightroom's Develop Module for in-depth coverage of the Lightroom editing tools. You can find this and other photo editing books in the Lenscraft Shop. I like most of what you have done to the image, but I find in the end it has a yellowy-green cast which I don’t find natural. The water looks like there’s an algae bloom going on. Does anyone else have a concern about the color cast? Otherwise, very informative, Robin. Thank you. For color management, I was also wondering which plugin from the nik collection would be the best to start with: Vivara or color effex. I must confess colors mamagement is the post-processing part I am the least comfortable with. I have noted you have used color effex in your tutorial. Do you prefer it to vivara? The thing with colour management is that you don’t need to use any plug-ins. It’s all about how you set up and configure your system. Once you have it congigures you can then start to edit your images with confidence. For that you may find plug-ins helpful. 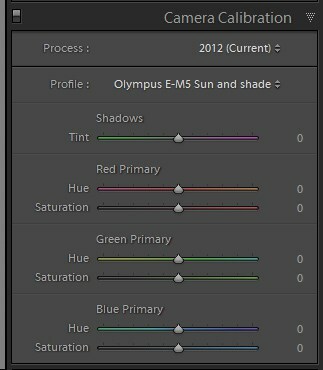 Personally I tend to correct all colour problems in the RAW converter (Lightroom) or using curves in Photoshop. Sometimes I find that a couple of the filters in Color Efex work well and help me. Very nice picture, as usual, as well as extremely useful description of your post processing and the rationale behind each step you got through. I uses LR for a while, plus the Nick plugins since I follow your blogs :-). I don’t have PS, only PS elements That I have never use so far. Would you have achieved the same result by using the color effex plugin in LR instead of PS? Are the Nick collection plugin compatible with PS elements? To answer your question, the Nik Plug-in’s will produce the same results in any of the supported applications. You might see some small variations if the host application can’t support 16 bitt files or larger colour spaces (e.g. Elements). The Nik collection can be used with Elements (since version 9 I believe) with the exception of HDR Efex Pro. I suspect this is because it needs to produce a 32 bit file and Elemetns is limited to 8 bit.